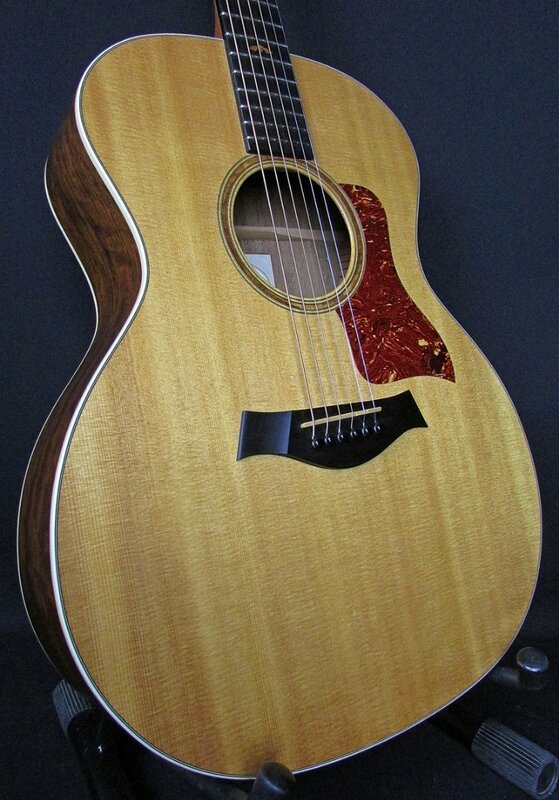 2007 Taylor 414-L30 Grand Auditorium 30th Anniversary is in excellent condition and perfect playing order. This guitar came to us from the original owner, who bought it new back in 2004. It's all original and overall in very clean shape. No breaks, cracks, or repairs. The top has a handful of small and subtle impressions and and dings. The back of the body has some subtle surface scuffing buckle rash on the treble side of the lower bout. The frets have a small amount of wear in the first position. The back of the neck has a small impressions. one behind the 1st fret at the low E. A small cluster of impressions and dings behind the D and G string at the 3rd fret. As well as a couple more subtle impressions behind the 8th fret. The tips of the headstock on the back side have some minor dings and dents as well. Made in USA and constructed from all solid wood. Bound solid sitka spruce top that has a high gloss finish, bound solid ovangkol back and sides that were given a satin finish, set mahogany neck with an ebony fretboard, 20 frets, koa inlays, koa rosette, tusq nut, tusq saddle, ebony bridge, and sealed tuning keys. Has a 1 3/4", standard 25 1/2" scale length, and weighs 4 pounds 10 ounces.